PDH Academy is a nationwide leading provider of continuing education for Speech-Language Pathologists, Physical Therapists, Physical Therapist Assistants, Occupational Therapists, Occupational Therapist Assistants, and Social Workers. 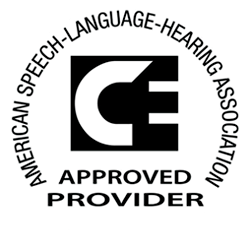 PDH Academy is approved by the American Speech-Language Hearing Association (ASHA), the Occupational Therapy Association (AOTA), various state Physical Therapy licensing boards, and the National Association of Social Workers (NASW). Whether you’re looking for approved continuing education to maintain your state license, or are just interested in expanding your knowledge, PDH Therapy Academy is your one-stop shop for fast, affordable continuing education courses. Our PDH Academy family of training companies provide continuing education for many different licensed occupations, including Engineers, Architects, Funeral Directors, Contractors, Cosmetologists, Massage Therapists, and several others. Susan Berkowitz received a B.A. in Psychology from Clark University, an M.S. in Speech-Pathology and Audiology from Tulane, and an M.Ed. in Education Administration from California State University at Fullerton. She also has extensive graduate background in Special Education and Applied Behavior Analysis, and has worked with children with autism for more than 40 years. Susan has worked in a variety of settings as a SLP, a Director of Education, and a Chairperson of the Speech Pathology Department. Her career has taken her to public and private schools, developmental centers, group homes, and adult day programs. She currently runs her own private practice in San Diego, providing Independent Educational Evaluations in speech-language, AAC, and Assistive Technology, as well as consultation and staff training. She presents at a variety of national conferences and provides workshops in AAC, autism, and literacy. Melissa Petersen, MA, CCC-SLP, NBCT-ENS received her education at University of Washington and Western Washington University. She works for Edmond School District as an Educational Speech Language Pathologist. Prior to being an SLP she taught internationally, as well as working with Lindamood Bell Learning Processes leading remedial reading programs in public schools. Her clinical interests include school-age fluency disorders, clinical supervision, and integrating Animal Assisted Therapy into school-based speech and language therapy programs. Jessica Holton, MSW, LCSW, LCAS has nearly two decades of experience and is a private practitioner specializing in treating Trauma & Stress Related Disorders, Anxiety Disorders, and Addictions. She earned her Master of Social Work and became certified in Social Work Practice with the Deaf and Hard of Hearing from East Carolina University. Jessica is active in leadership roles with the National Association of Social Workers (NASW) at the local, state, and national levels (Co-Chair of NASW-NC’s Greenville’s Local Program Unit from 2005-2012; Elected as NASW-NC’s President Elect (2011-2012) and NASW-NC’s President (2012-2014); Appointed to NASW’s Alcohol, Tobacco and Other Drug (ATOD) Specialty Section Committee as a committee member in 2008, then appointed as the Chair in 2010 to 2016, and recently returned to a committee member. Jessica is involved with Addiction Professionals of North Carolina, as well, in which she was elected as a Member At Large for a three year term (2017 to 2020). Jessica has written many professional newsletter articles, several peer-reviewed journal articles, and has presented nationwide at numerous conferences. She is passionate about learning, sharing her knowledge and elevating her profession. She also received the East Carolina University School of Social Work Rising Star Alumni Award in 2012, selected as The Daily Reflector’s Mixer Magazines 30 under 30 in 2007, Wilson Resource Center for the Deaf and Hard of Hearing Community Service Award in 2005 and the National Association for the Advancement of Educational Research Annual Conference Award for Service to the Profession 2002 Outstanding Researcher. Jessica Holton is not a neuroscientist or neurobiologist; however she is a Licensed Clinical Social Worker and Licensed Clinical Addictions Specialist who has a great deal of respect for neuroscientist and neurobiologist. She is fascinated with learning about the neuroscience of addictions and other emotional and behavioral disorders. As a new clinician, discovering information about the neuroscience of addiction, trauma responses, stress response, et cetera proved to be timely and necessary in providing effective and evidenced based treatment to the individuals that she treated. She has continued to build her knowledge-base over the years by attending trainings, reading literature (i.e. books, magazine articles and peer-reviewed articles), listening to various TED (Technology, Entertainment, Design) Talks and podcasts, referencing reputable websites and using applications (i.e. 3D Brain, Headspace). Jessica will share her understanding of the basic neuroscience of addiction, both chemical and behavioral. She will also explain suggested adaptive coping skills, which weave in the discussed neuroscience of addiction. Carrie Clark, CCC-SLP, is a speech-language pathologist from Columbia, Missouri. After graduating with her Master’s degree from Truman State University in Kirksville, Missouri, Carrie worked as a speech-language pathologist in the schools and later in her own private practice. Through Carrie’s work, she saw an ever-growing need for accessible information about speech and language therapies and research to be available for parents as well as for speech-language pathologists. Carrie created the website www.SpeechAndLanguageKids.com to fill that need, sharing information and resources with other speech-language pathologists and parents of children with speech and language delays. Speech and Language Kids now serves thousands of visitors every day by providing easy-to-follow, step-by-step activities and guides for teaching a variety of speech and language skills to children with speech and language delays and disorders. Kristin Bowers is an ASHA-Certified Speech Language Pathologist, and received ASHA’s Award for Continuing Education (ACE) in 2014. She graduated from the University of Pittsburgh in 2007 with a B.A. in Communication Science and Disorders, and in 2010 with an M.A. in Speech Language Pathology. Kristin has utilized her skills as a Speech Language Pathologist abroad, including her participation in the Bosnia Autism Project in 2012 where she traveled to Bosnia to provide training to related professionals. She has experience in the early intervention (3-5) setting as well as in private practice, and currently works in the school setting servicing children from K-5th grade. She is also the owner of Kiwi Speech, LLC, which creates materials for speech and language services, primarily available on Teachers Pay Teachers. Shari A. Robertson, Ph.D., CCC-SLP, is a Professor of Speech Language Pathology and Dean’s Associate for Graduate Studies at Indiana University of Pennsylvania. Dr. Robertson spent 18 years as a school-based SLP and special education administrator prior to obtaining her Ph.D. at the University of Wisconsin-Madison. She recently served on the ASHA Board of Directors for as Vice President of Academic Affairs in Speech-Language Pathology and owns several companies, including a publishing company and a consulting business. Shari has published numerous articles, book chapters, and clinical materials and presented several hundred workshops at state, national, and international venues related to language and literacy. She is known for providing practical, evidence-based information that can be immediately used in clinical practice. An Associate Professor at Western Kentucky University, Lauren Bland has served as the Interim Associate Dean for the College of Health and Human Services and the Interim Department Head for Communication Sciences and Disorders; she has also taught graduate courses in Speech Sound Disorders, Disfluency, Counseling and Professional Issues. In addition to presenting several times at the American Speech Language-Hearing Association, she has served on several Convention program committees and the Scientific and Professional Education Board, and is a site visitor for ASHA’s Council on Academic Accreditation in Audiology and Speech-Language Pathology. Dawn T. Gulick, PT, PhD, ATC, CSCS, is a Professor of Physical Therapy at Widener University in Chester, Pennsylvania. She has been teaching for over 20 years. Her areas of expertise are orthopedics, sports medicine, modalities, and medical screening. As a clinician, she has owned a private orthopedic/sports medicine practice. She also provides athletic training services from the middle school to elite Olympic/Paralympic level. As a member of the Olympic Sports Medicine Society, Dr. Gulick has provided medical coverage at numerous national and international events. As a scholar, Dr. Gulick is the author of 4 books (Ortho Notes, Screening Notes, Sport Notes, Mobilization Notes), 4 book chapters, and over 50 peer-reviewed publications, and has made over 100 professional and civic presentations. She is the developer of a mobile app called iOrtho+ (Apple, Android, & PC versions), and the owner of a provisional patent. Dr. Gulick earned a Bachelor of Science in Athletic Training from Lock Haven University (Lock Haven, PA), a Master of Physical Therapy from Emory University (Atlanta, GA), and a Doctorate of Philosophy in Exercise Physiology from Temple University (Philadelphia, PA). She is an AMBUCS scholar and a member of Phi Kappa Phi Honor Society. As a licensed physical therapist, she has direct access authorization. She also is a certified strength and conditioning specialist. Jeffrey Larson, PT, ATC, is the director of physical therapy at the Tioga Medical Center in Tioga, ND. He is a graduate of North Dakota State University and the University of Utah. He holds degrees in both athletic training and physical therapy. He is also a medical writer and founder of Northern Medical Informatics, a medical communications business that he operates with focus on continuing education for the allied healthcare professions as well as consumer health education. He is a member of the American Physical Therapy Association and the American Medical Writers Association. Joseph W. Spagnolo PT, DPT, OCS, MTC received a BA in History from the University of Virginia, a Masters in Physical Therapy from Virginia Commonwealth University, and a transitional doctoral degree and Manual Therapy Certification from The University of Saint Augustine. He is an Orthopedic Certified Specialist through the American Physical Therapy Association. Since 1997, he has been employed by Rehab Associates of Central VA, where he became a partner in 2002. He specializes in the foot and ankle, and treats a wide range of patients, including athletes, post-surgical, and degenerative conditions. Brian Trzaskos, PT, LMT, CSCS, CMP, MI-C, is a bodymind rehabilitation specialist who believes education is powerful medicine that allows people to access their own highest healing potentials. A graduate from the State University of New York at Buffalo, he is the founder and director of the Institute for Rehabilitative Qigong & Tai Chi, which specializes in teaching rehabilitation professionals how to practically integrate western bodymind rehabilitation science and the ancient healing arts of Qigong & Tai Chi. As a practicing physical therapist and student of eastern movement and meditation practices for over two decades, Brian holds certifications in both Western and Eastern healing arts, truly bringing together the best of both worlds in modern rehabilitative care. In addition to his private practice, he is a teacher, author, international health consultant, and thought leader in holistic rehabilitation. Doreit S. Bialer, OTD, MA, OTR, received BS and Advanced Masters degrees in Occupational Therapy from New York University and a Post-Professional Doctorate in Occupational Therapy from Rocky Mountain University in the area of Pediatric Science. Dr. Bialer holds certifications in Neurodevelopmental Therapy in both Pediatrics and Adults and in the Administrations and Interpretation of the Sensory Integration and Praxis Tests. She is also a certified Pilates Mat Instructor and holds a Personal Training Certification from Hofstra University Academy of Applied Personal Training Education (AAPTE). Dr. Bialer is an experienced seminar leader, educational adjunct instructor, and lecturer, providing numerous clinical workshops across the country on the topics of Sensory Processing Disorder, School Based Therapy, and Therapeutic Pilates. She has presented at the National Symposiums for Sensory Processing Disorder and Autism, where she had the honor of being part of an established host of speakers including Dr. Temple Grandin and Dr. Lucy Jane Miller. She has taught both undergraduate and graduate students in occupational therapy programs at New York University, New York Institute of Technology, and at Touro College in New York; she has also been an independent provider and consultant to school districts and preschools, working as a clinician, director, and supervisor to many occupational therapists and certified occupational therapy assistants. She is the co-author, with Dr. Lucy Jane Miller, of No Longer A SECRET; Unique Common-sense Strategies for Children with Sensory and Motor Challenges, published by Sensory World, 2011 (Future Horizons). In addition, she is a private practitioner working in Locust Valley, New York, where her goal is to help children and families successfully function and participate in the home, school, and community. Maude Le Roux, OTR/L, SIPT, RCTC, DIR® Certificate, Clinical Director at A Total Approach, is an accomplished occupational therapist with great affinity for learning and understanding the human brain. She was born and raised in South Africa, and graduated from the University of Stellenbosch in Cape Town in 1984. Maude married Charl Le Roux in 1986 and moved to the USA in 1993. Together, they opened A Total Approach in September 2001. Maude is SIPT certified and specializes in Sensory Integration services as it applies to functional activities of daily living, including improving the ability of any child to partake in his/her learning environment. She also holds a certificate in DIR®/Floortime™, and is a certified Tomatis Consultant. Maude has presented her Tomatis work in Dublin, Greece, France and Panama. Maude is an international trainer in Tomatis Sound Therapy,DIR/Floortime through ICDL, Interactive Metronome, Cellfield Reading Intervention, as well as for the courses she had developed herself. She has participated in multiple national and international speaking engagements with regards to the field of sensory integration, Autism and Attachment. Maude serves on the board for ATTACh. She has published two books, The Listening Journey for Children and Our Greatest Allies, available through www.amazon.com. Amy L. Paulson OTR, CHT is a certified hand therapist with over 19 years of experience in outpatient upper extremity care. She has been a licensed occupational therapist for 20 years, has experience in home health, skilled nursing, and acute care, and is a member of the American Society of Hand Therapists. Amy has led multiple community-based classes on arthritis care, energy conservation and work simplification, and she taught as an adjunct professor at Palm Beach Community College in the OTA program. She designs and instructs hands-on continuing education courses in splinting and upper extremity treatment, and enjoys providing clinical instruction to students interested in specializing in hand therapy. She is also involved in coordinating and overseeing therapy programs in Gulu, Uganda by volunteering with the Medical Missions Foundation of Overland Park, KS. Amy currently owns and operates her private practice in outpatient hands, where she provides patient care, clinical instruction to Level II students, community education, marketing, and insurance billing. Midge (Annamaria) Hobbs, OTR/L, originally from the UK, graduated with an MA in Occupational Therapy from Tufts University, Boston MA in 2005. She spent the following ten years working in long-term acute care gaining experience as a clinician, educator, and manager. In 2010, Midge was selected for the inaugural cohort of AOTA’s Emerging Leaders Development Program (ELDP). Since then she has continued to amplify AOTA’s leadership initiatives by serving the Emerging Leaders Development Committee (ELDC) as Chairperson and as a member of AOTA’s Volunteer Leadership Development Committee (VLDC). She is currently the Editor of AOTA’s A Mindful Path to Leadership, a new online self-paced leadership development course, and she co-authored Module 3: Mentoring and Leadership with current AOTA president, Amy Lamb. Midge is currently employed as a consultant for internship development in the adolescent residential psychiatric programs at Sheppard Pratt Hospital in Baltimore MD, an adjunct professor at the MGH Institute of Health Professions in Boston, and a clinician at local rehab and assisted living facilities. Midge is also enrolled at Thomas Jefferson University for her post-professional OTD with a specialty in teaching in the digital age. In her limited spare time she watches English soccer and eats a lot of popcorn. Jeryl D. Benson, EdD, OTR/L, earned a BS in Occupational Therapy and a MS in Motor Development from the University of Pittsburgh. She earned her doctorate in Education from Duquesne University. She has over 25 years of clinical experience in the area of pediatrics and school based occupational therapy practice. She has worked with a variety of disabilities including autism/PDD, cerebral palsy, learning disabilities, and intellectual developmental disabilities in both public and private schools, as well as outpatient practice. She has advanced training in the Neurodevelopmental Treatment Approach, certification to administer the Sensory Integration & Praxis Test, is a certified infant massage instructor, is TEACCH trained, and has been Board Certified in Pediatrics through AOTA. Ms. René Ledford is a Licensed Clinical Social Worker and Board Certified Behavior Analyst with over 30 years’ experience managing child and adult mental health, residential treatment, child welfare programs. In addition to extensive experience in social services, she has worked as both a Trainer and Project Manager for Prosync, Inc. (now The Paxen Group), a nationally recognized leader in customized training and performance contracting. Currently Director of Behavioral Health Quality for Children’s Home Society of Florida (CHS) she leads statewide quality improvement activities for behavioral health programs, trauma-informed practice development and statewide trauma training initiatives. She also serves as the Statewide Trainer for CHS’ Category III Trauma Recovery Initiatives (TRI) grant project. René is a graduate of the Florida State University Harris Institute Infant Mental Health program and is trained in trauma-informed interventions including Child Parent Psychotherapy, TF-CBT and Parent-Child Interaction Therapy. She has developed and/or presented numerous continuing education programs and among other trauma-informed curricula, is an Experienced Trainer of NCTSN’s Child Welfare Trauma Training Toolkit (CWTTT). René was also a contributor for the revised CWTTT and Trauma-Informed PS-MAPP curricula. Additionally René is a Council on Accreditation (COA) Peer Reviewer and the 2015 Past-President and 2016 Director of Social Media for the Association for Talent Development, Central Florida Chapter. Kori Ryan, Psy.D. is an assistant professor of behavioral sciences at Fitchburg State University. Dr. Ryan has been involved in the areas of research, program development, teaching and training, and clinical assessment and intervention in the intersecting systems of criminal justice and mental health. In addition to her academic career, Dr. Ryan has provided evidence-based interventions and conducted clinical and forensic evaluations with diverse populations presenting with major mental illnesses and criminal behaviors, including court-mandated adolescents and adults. Dr. Ryan has provided clinical and forensic services in a variety of settings, including educational, psychiatric, and correctional. Additionally, Dr. Ryan has program development experience in the broader areas of violence, abuse, and trauma. Dr. Ryan’s research and clinical interests include improving multi and interdisciplinary teaching and training across disciplines, the intersection between the criminal justice system and human services, clinical and forensic assessment, and clinical and forensic ethics. Laura Gibson, PhD, LCSW, has been practicing clinical social work for more than 18 years. She earned a Bachelor of Science degree in psychology from Bridgewater State College (now Bridgewater State University), a master’s degree in social work from the University of Southern Indiana, and a doctor of philosophy degree in social work from the University of Louisville. Dr. Gibson is a licensed clinical social worker in both Indiana and Kentucky. She is an item writer for the Association of Social Work Board’s (ASWB) master’s-level licensing examination for social workers and is a former member of the Examination Committee. She is a book review editor for the Journal of Social Work Values & Ethics. Dr. Gibson is an assistant professor and the MSW Program Director for Brescia University in Owensboro, Kentucky.